Flowering Tea is more than a drink, it's an experience. The tea lover in your life will appreciate the rich aromas and flavors of pure Grade AA green tea leaves and natural jasmine while watching the one-of-a-kind hand tied edible flower bloom in front of their eyes. Every teapot promises a fresh adventure. Simply place a flowering tea ball into a clear, heat-resistant borosilicate teapot and carefully cover with 3 to 4 inches of boiling water. This will ensure the flower has plenty of room to bloom properly. Allow to steep for 5 to 10 minutes - until leaves have fully opened. Swirl to balance flavors and pour to enjoy. Treat yourself to a special summer refreshment when you pour the tea over a glass of ice. Refrigerate tea flowers in a sealed container and enjoy another 2 to 3 more times. Your satisfaction is our first priority. We stand behind our Blooming Tea Flowers with a full money back guarantee. If you don't absolutely love your teas, we want to know. 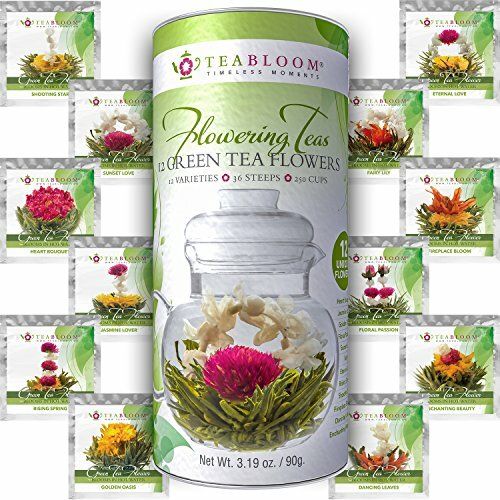 Get 10% off with promo code 'TEABLOOM' when you buy 2 or more Teabloom products. THE BEST WAY TO EXPERIENCE BLOOMING TEA: This beautiful tea gift set of 12 green tea blossoms features a selection of flavors and aromas sure to delight every tea lover's palate. Each flowering bouquet is hand tied by skilled Teabloom tea artisans. 12 SIGNATURE FLOWERING TEA VARIETIES IN EVERY CANISTER: Contains 1 each of: Heart Bouquet, Jasmine Lover, Golden Oasis, Floral Passion, Sunset Love, Fairy Lily, Eternal Love, Rising Spring, Shooting Star, Fireplace Bloom, Dancing Leaves and Enchanting Beauty. TEA FLOWERS PICKED AND SEALED AT THE PEAK OF FRESHNESS: Each blooming tea ball is sealed in airtight foil to protect its freshness, along with all those healthy antioxidants and polyphenols. You'll love how all the natural flavors and aromas are preserved. FLOWERING TEA BALLS BLOOM BEFORE YOUR EYES: Enchant your friends. As each tea ball steeps, it slowly transforms into a delicate flower arrangement. Each flowering tea bouquet is as unique as it is delicious. Simply cover with 3-4" of boiling water. 100% MONEY BACK GUARANTEE: We stand behind our Blooming Tea Flowers with a full money back guarantee. If you don't absolutely love your teas, we want to know. Get 10% off with promo code 'TEABLOOM' when you buy 2 or more Teabloom products. If you have any questions about this product by Teabloom, contact us by completing and submitting the form below. If you are looking for a specif part number, please include it with your message.